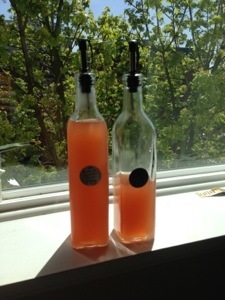 Today’s tasty treat is the Rhubarb Lavender Shrub. Doesn’t that look lovely? Mix it in a glass some some soda and vodka or gin and you have Spring in a glass! What’s a Shrub? Well, it’s one of the oldest ways of preserving fruit in order to drink it later. Shrubs are based on sugar, fruit and vinegar and keep well, even out of the refrigerator. Some are heated, but this one isn’t – you do this all in the refrigerator. I’ve based this recipe on one found at HungryTigress.com. I cut the recipe in half and changed it to use culinary-grade dried lavender instead of fresh – mostly because I have a ton of the stuff (ok, a pound, but that’s basically a TON of lavender). WARNING: This takes over a week to complete! Wash the rhubarb, split the stems in half and then chop into 1/2 inch pieces. Place rhubarb in glass bowl, cover with sugar and stir to mix thoroughly. Cover bowl with towel and allow to sit overnight, stirring a couple times to recombine. As time passes the sugar will pull the moisture out of the rhubarb and partially dissolve, leaving you with a messy looking sugar/syrup/rhubarb/lavender combination. Lick the spoon after stirring – mmmm, tasty already! The next morning move the entire mess into a glass jar, add the lavender, stir and cover. At this point there will still be undesolved sugar – that’s fine. On the seventh day, get out a deep bowl and a fine-meshed strainer. Place the strainer over the bowl, dump the whole mess into the strainer and encourage as much of the syrup to move out of the strainer and into the bowl as possible. Don’t mash the rhubarb too much, but feel free to stir it around and poke at it a bit. Cover the whole mess with a towel and allow to sit out on the counter overnight to drain. The next morning remove the strainer and whisk in the two cups of apple cider vinegar. Taste to make sure you have the vinegar right (mine was just fine). Then decant into a nice bottle or two and stash in the refrigerator. The original recipe says to allow this to sit for another 24 hours, but we didn’t bother. It will hold for about 3 months in the refrigerator. Same as Shrub and Soda, but add 1 1/2 ounces of Vodka and decrease the soda as required. Same as Shrub and Soda, but add 1 1/2 ounces of Gin and decrease the soda as required. This entry was posted in Drink, Marlow, Shake and tagged gin, lavender, rhubarb, Shrub, soda, Spring, syrup, vodka by marlow. Bookmark the permalink.